In a Lonely Place is a coincident film within the careers of Humphrey Bogart (Casablanca), Gloria Grahame (The Bad and the Beautiful), and director Nicholas Ray; despite being an adaptation of a novel by Dorothy B. Hughes, it is the most personal film for each of the three. For Bogart, the character of alcoholic screenwriter Dixon Steele revealed the real-life vulnerability and mercurial temper that afflicted the actor. In Graham's case, the film highlighted some of her insecurities vis-a-vis her marriage to Ray. And in regards to Ray, its story of a romance gone off the rails paralleled the slow disintegration of his relationship with Grahame while giving us a glimpse into Hollywood's early days. This may explain the atypical unspooling of what is often classified as a film noir. It bears one of the genre's hallmarks, an antiheroic protagonist with a self-defeating flaw—Bogart's lonely Dixon Steele, a screenwriter who bears more than a passing resemblance to Robert Ryan's writer character in Ray's previous film Born to be Bad, except for the added defining quality of an uncontrollable temper. Burnett Guffey's expressionistic cinematography delineates the claustrophobic boundaries of the shadowy purgatory Steele now finds himself in as the police circle about him, questioning whether he murdered a hat-check girl last seen leaving his apartment. A blunt-speaking blonde, Grahame's struggling actress Laurel Gray dwells in the same complex as Steele and provides him his alibi. She informs the cops of the murdered girl's early, unaccompanied departure from Steele's abode. Ray is even canny enough to place us squarely in Dix's head for a few p.o.v. shots in his apartment—the viewer as Steele—as Mildred (Martha Stewart), the girl to be found dead later, synopsizes a story the writer plans to adapt for his next movie looking straight into the camera. We watch Steele's initial plan to seduce the naive, starry-eyed groupie in his flat literally disintegrate as we see her the way he now does: shrill, grating, and unworldly. We've met Grahame's Laurel already as Dix walked into their shared courtyard with young Mildred, and now we see Laurel again, through his window, standing on the balcony overlooking his apartment as he escorts Mildred out. Cut to morning when Dix is woken up by his old friend, Detective Brub Nicolai (Frank Lovejoy) and taken downtown for questioning. With rare exception, we see what Dix sees. When he sleeps, the film just skips forward. But that leap forward elides past the crucial moment when Steele may have murdered poor Mildred. Luckily, Steele remembers Laurel on her balcony, and the cops bring her downtown to back up his alibi. This meeting sparks a mutual romantic interest between the two, and after some trepidation on the part of Laurel, a full-blown relationship. It is here that "an interesting thing happens," Danny Peary states in his Guide for the Film Fanatic. "Grahame becomes the main character." Now, we are with Laurel when she is called back to the police station for a follow-up interview. When a masseuse warns her that Steele used to beat up another woman she used to work on (Dix's ex-girlfriend we saw earlier at Paul's), we are in the room with Laurel. At a beach party with Nicolai and his wife (Jeff Donnell), it is through Laurel's bewildered eyes that we see Steele fly into a rage after discovering she spoke to the cops again. It is from Laurel's point of view that we see Steele beat a young motorist nearly to death after he cuts Steele off in traffic and calls him a "blind, knuckleheaded squirrel" (a scene that prefigures one in David Lynch's Lost Highway (1997) in which Robert Loggia almost kills a motorist for tailgating him through the L.A. canyons). As Laurel becomes more and more confused about whether Steele is capable of having murdered Mildred, director Ray spends less and less time with Dix. 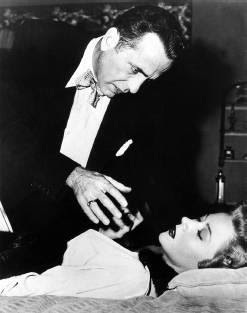 Life on the set [of In a Lonely Place] was obviously fraught with emotional hazards. Ray had modeled the movie's apartment complex on an apartment he once occupied at Villa Primavera in West Hollywood. When he moved out on Grahame, I learn from critic J. Hoberman, Ray actually moved onto the set and started sleeping there. Perhaps the depth of resentment stirred up by the film's depiction of amour fou gone wrong had some influence on the demise of Ray and Grahame's marriage, which ended on a rather lurid note. (Rumors had Ray discovering her in bed with his 14-year-old son, whom she would later marry when he came of age.) Dix and Laurel are finally undone by a near fatal flare-up of his rage just as he's found innocent of the murder. Ray would revisit this type of man again in characters like Robert Ryan's Jim Wilson from On Dangerous Ground or Sterling Hayden's Johnny Logan from Johnny Guitar. Picking up where he leaves off with Steele, in a way, Joan Crawford's Vienna rekindles her romance with Logan from 5 years before the events depicted in Guitar, when Logan and Vienna broke it off because Logan was "gun-crazy." As for In a Lonely Place's Steele, he walks away from Laurel into an uncertain future, a fate not unlike that of Robert Ryan's Nick Bradley in Born to Be Bad. Except this time, it's all the writer's doing, not his paramour's. This is a revised version of a review first published on March 19, 2010.